An effortlessly sophisticated 9ct white gold bridal ring set from the desirable Perfect Fit collection. The stunning engagement ring is styled with a sparkling central collection of baguette cut diamonds with a dazzling diamond surround. Sitting alongside it is a glittering diamond set wedding band. Perfect for your special day. 9ct White Gold 3/4ct Diamond Perfect Fit Bridal Set is rated 5.0 out of 5 by 1. Rated 5 out of 5 by Anonymous from All that glittrs Wow ordered this ring and havent stopped smiling.It has a vintage look with a modern edge. 3 central baguettes edged with small diamonds. The wedding band compliments this perfectly it is quite delicate but sits perfectly with the engagement ring. 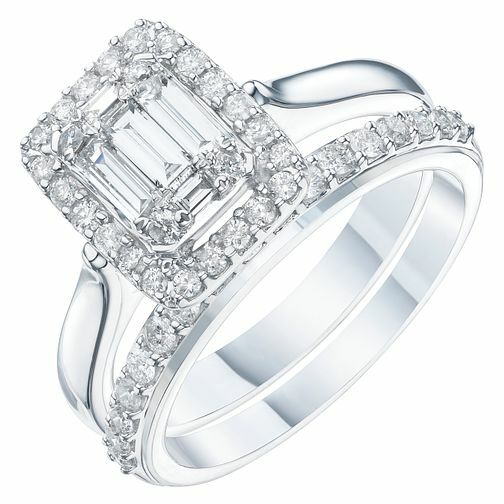 This ring makes a classy statement it is perfect and i cant wait for next year to wear the wedding band. You wont be disappointed with this it just doesnt stop sparkling from every angle.